The story of the painting’s journey crosses country boundaries and centuries of time. About one hundred years after the painting was completed, an engraving was made of the work by Wenceslaus Hollar, a Bohemian engraver. Over twenty copies of the painting are known to exist. It was in 1763, upon the sale of the contents of Buckingham House (now Palace) that the painting disappeared from view. 137 years later, in 1900, Sir Frederick Cook acquired the painting for his personal collection. Cook’s descendants sold the work at auction in 1958 for £58.00, believing it to be yet another copy-and a poor one at that. As with nearly all works of the Renaissance, there were many copies made over the course of centuries. 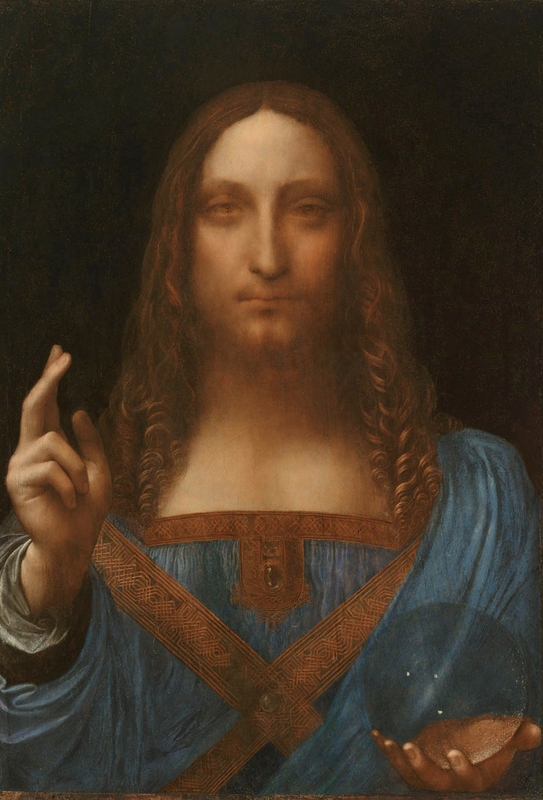 Such is certainly the case of the Salvator Mundi, whose copies number over twenty. It was only upon further inspection and study by the art historian and New York art dealer, Robert Simon, and a team of other experts that the hidden secrets of the painting became known. Damaged by numerous attempts at restoration, including poor work on the wood panel upon which the work was painted, it took patience, the use of x-ray and infrared study as well as other scientific methods to discover that this is the original da Vinci. There were many crucial points of evidence that have convinced the art world that this is truly by Leonardo. 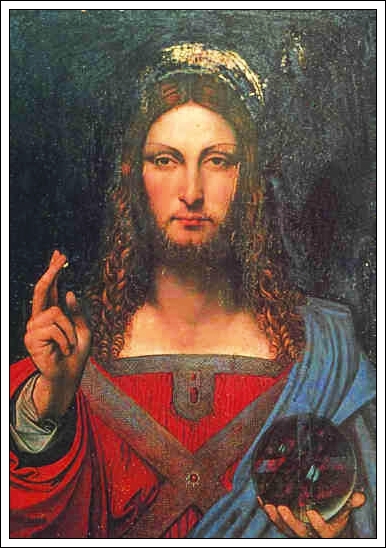 The attention to the detail of the painting, the beauty of the crystal orb that Christ holds in his left hand (a symbol of the world) and, most importantly, pentimenti, proved the marks of the master. Pentimenti? These are preliminary positioning and design that the artist changes in the course of the work. The detail that finally gave the conservators the information they needed was, interestingly enough, was the thumb on Christ’s raised hand. Upon infrared inspection it was discovered that the thumb had originally been in a slightly different position than that on the final work. Further, the pigment’s consistency, the type of media used and the technique all prove, without doubt, that this is the original. Art experts from Florence to Milan, New York, Washington and Paris studied the restored work and all have agreed; da Vinci’s work. What is still not clear is when or where the painting was completed. Some believe it was painted in Milan around the time of the Last Supper. Others believe that it was painted in Florence after Leonardo moved to the city in 1500. Regardless, the fascinating and mesmerizing eyes, the finely captured blessing hand and the living and breathing figure we encounter only serve to add further mystery to the works of Leonardo. As part of the Art and History of Renaissance Art class, this video is used to introduce the students to the music and art of certain periods of Florentine art. I hope that you will enjoy this brief (Four Minute) presentation and, as always, thank you for taking the time to read about bella Italia with “Travels Across Italy”! 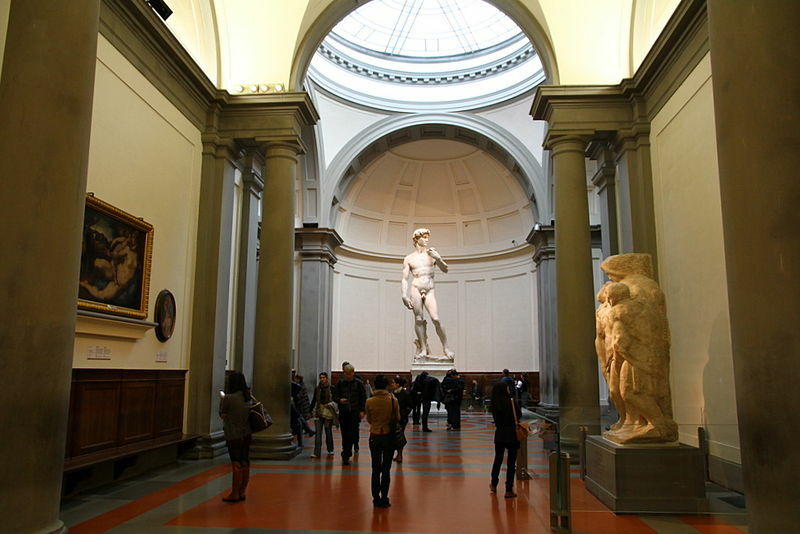 Michelangelo’s David towers over the history of Renaissance art in Florence. 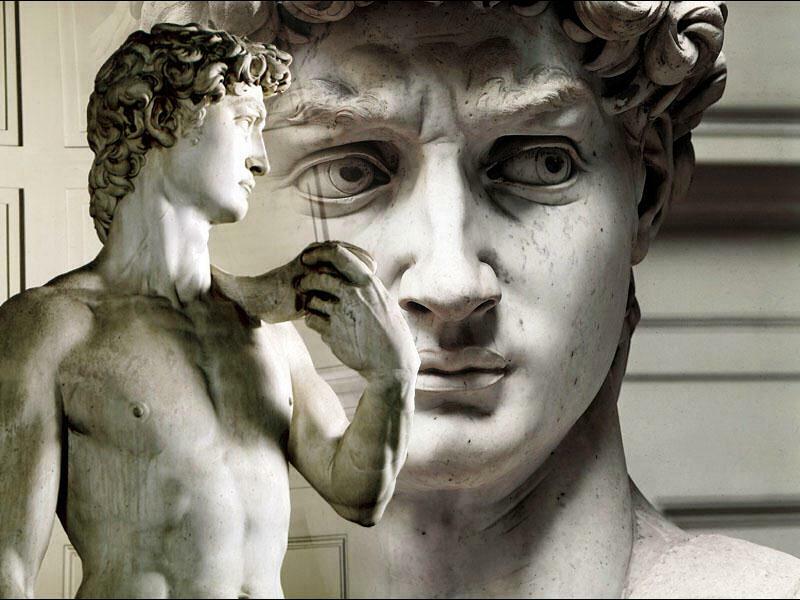 His expression of beauty, idealized and immortalized in stone, has drawn millions of visitors from around the world. Yet, there are other Davids, equally fascinating and artistically important, across the city of Florence. Four remain in the city and two have been placed in other collections. 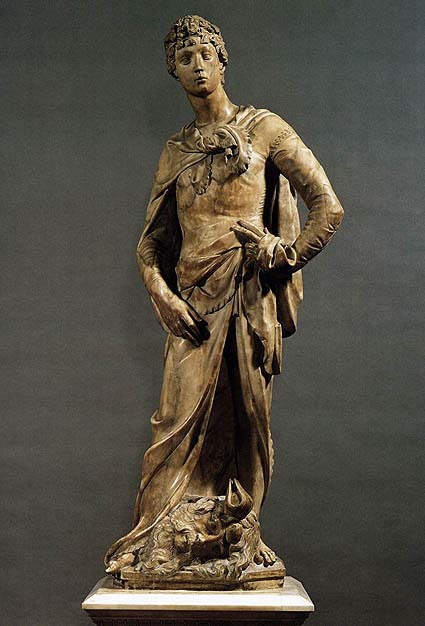 One of the earliest pieces sculpted by Donatello is his first David, completed in 1409. Though the work was given additional touches by the master in 1416, it still stands as a monumental change in the style of the more staid and accepted statues of his day; the mark of a master artist. This is a gentle David, not a fierce warrior. The position of the fingers on the left hand, the curve of the body in a kind of easy repose, the lay of the right hand over the center of the body all convey someone at rest, someone who has not just beheaded a Goliath and turned the fortunes of war. Laying almost serenely at his feet, the head of the giant peers out from between David’s feet. Perplexing in its ease, confounding in its implied intent, this is truly a master’s piece. The masterpiece of the collection of these varied and unique works of art is, I believe, the Donatello bronze David. Michelangelo is quoted in many sources as saying it was Donatello’s work, his eye and his commitment to an entirely new way of creating sculpture, that inspired Buonarotti’s work. Donatello’s is the second oldest of the Florentine Davids, having been completed in 1440. It was commissioned by Cosimo di Medici to be placed in the central courtyard of the family’s home in the center of Florence. Cast in bronze and astonishingly different, viewers who study the piece – its details and hidden messages – are constantly amazed at its complexity. As with many masterful works of art, Donatello’s vision of the young David incites criticism and inquiry. Why does Goliath have a helmet on his head? If David’s slingshot is, as the Bible implies, capable of accuracy with a stone, would that stone have penetrated the helmet? Would the blow have been so strong as to kill the Goliath? Why does Donatello’s work figure a man as you view the piece from the front, yet from the back seems so feminine? The asexuality of this David presents one of its most confounding questions. Then, there is that feather…Goliath’s helmet was cast with two feathers on it. One has been crushed by David’s foot, yet the other feather caresses nearly the entire distance of the inner right thigh. Was the feather used to create increased stability for the pose of the cast bronze? Was it a slap in the face of the supposedly conservative morals of a city that was known to be anything but conservative? Is this Donatello David an homage to the ancients – a rebirth of the classic bronze nudes of Greece? The list continues. The more a viewer takes the time to study the statue on the first floor gallery of the Museo Nazionale del Bargello in Florence, the more questions that viewer takes away. It was in 1473, that Andrea del Verrocchio began work on his bronze statue of David. (Note: Many art historians estimate the work to have been completed in ca. 1465). 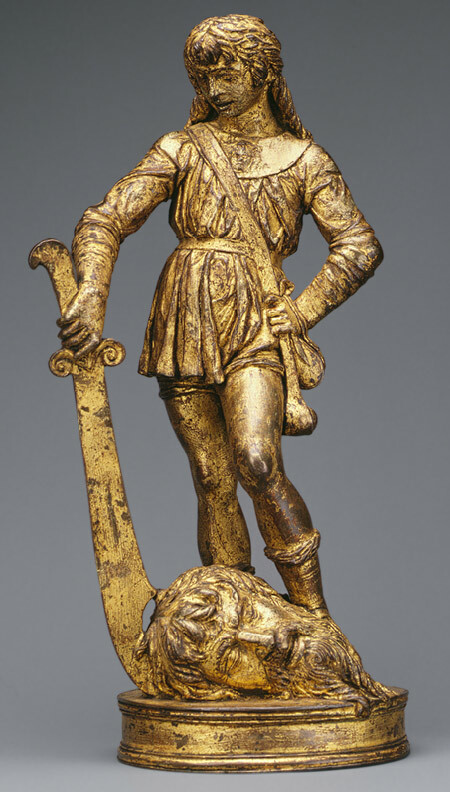 This work mimics the asexual posturing of the Donatello bronze David in many ways. The languid curve of the body, the position of the hand on the statue’s left hip, and a sword that seems to be held at the ready all underscore, once again, the figurative representation of Florence’s idealized vision of itself. The commission that Verrocchio received was for the work to be displayed in the Medici home. A recent restoration of the bronze has uncovered gilding, hidden by centuries of varnish and pollution. Additionally, the placement of Goliath’s head on the piece, as originally intended, seems not to be where it has lain for centuries. Many art historians now believe that the head was originally intended to lay to the right of David’s right foot. At a recent loan to the High Museum of Art in Atlanta, the head was so positioned raising even more questions about this masterpiece of Renaissance art. It is interesting to note that, until the next statue of David was commissioned, Verrocchio’s bronze still interpreted the youth as relatively weak, ostensibly incapable of violence. The piece now has a place of importance in the Museo Nazionale del Bargello in Florence. 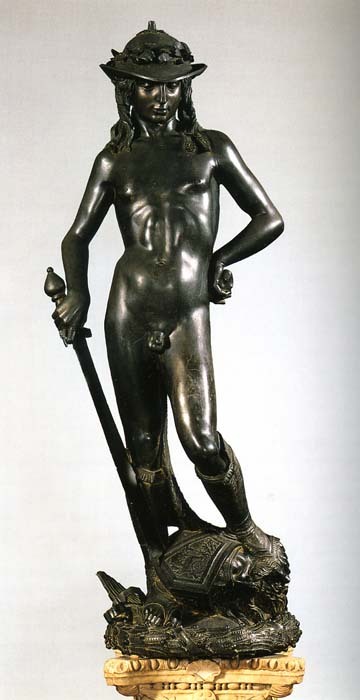 Sometime between 1470 and 1480, another young sculptor who was a student of Donatello, one Bartolomeo Bellano, created a bronze cast statue of David. This work, gilded on bronze, is another curious representation of the moments after Goliath’s death. Rather than head up in pride and strength, Bellano’s work shows the young man posed in a very similar way to Donatello’s bronze: the sword supports the right arm, the sling lays loose at the figure’s side, the head of the giant lays between the feet of the conqueror. This particular piece, though created in Florence, now is part of the Met Museum’s collection in New York City. 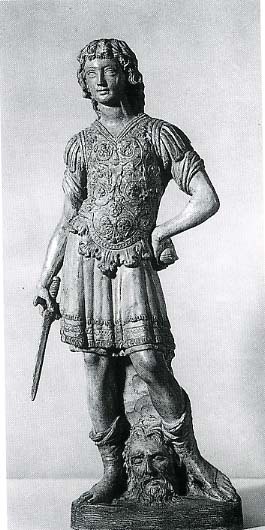 An anonymous sculptor, known as the Master of the David and St. John statuettes, created a David out of terracotta in 1490. Absent the fact that this statue was created from fired terracotta rather than bronze, this work reflects very strongly the influence of Verrocchio’s 1476 work. The hand position, the lay of the hand on the left hip, the position of the sword all are similar in both style and, it seems, creative intent to that of Verrocchio. This piece is currently in storage and is not available for public viewing as of the date of the blog post. Now comes Michelangelo. The young master selected a piece of Carrara marble that had long been abandoned in a side yard of the city’s cathedral workshops. Rossellino – who had attempted years before to carve the piece, had ceased to work on it for reasons still unknown. The Operai, those who were responsible for the works of the Duomo, were commissioning sculptors to create large statues to be placed along the buttresses of the Duomo, Santa Maria dei Fiori. Michelangelo’s persistence and insistence that he should have the commission, even after masters like Leonardo da Vinci had been consulted, finally paid off. The Operai made it clear that this David was to be strong and veral. Since this statue was to be a major work for the duomo, it was to communicate to the world, THIS is Florence, this is the city of the Medici, of art and of financial power. Whatever anyone’s interpretations are, the first view of the statue, mounted on a large base at the end of a low-lit corridor that is lined with Michelangelo’s “Slaves” (once displayed outdoors in the Boboli Gardens behind the Pitti Palace) is breathtaking. Few are unaffected by the stunning visual impact of Michelangelo’s masterpiece. The physics of moving such a heavy piece of marble to the top of the cathedral generated long discourse over the appropriate location for the statue. Final agreement was reached that it should stand outside the entrance doors of the city’s Palazzo Vecchio, the seat of the city government. It remained there from 1504 until 1873 when it was moved into the protection of the Accademia di Belle Arti. The space that was once occupied by the David, in front of the Palazzo Vecchio, remained empty until 1910 when a copy of the David was placed in the same location. Michelangelo’s intent in leaving the head of Goliath completely out of the work was in keeping with the Operai’s original intent that the work would surmount the entrance of the city’s cathedral. Others have interpreted the absence of the giant’s severed head as indication that Michelangelo created a young man who had made the decision to kill Goliath. The stone in the statues right hand and the position of the sling over his left shoulder seem to support that view. The fierce determination on the young man’s face, especially when seen straight on in photographs, also shows a focused determination to action. As with all things Florentine, surprises are found in nearly every museum, every piazza, every palazzo. When you are in the city, be sure to expand your understanding of the history of David. Many exist and each deserves the same attention that “the David” has garnered for centuries. Lines at the Accademia for public access are, during the summer, as long as a two hour wait. To avoid that delay, you can prepay for tickets to the Accademia to see the David on a specific day and for a specific time. Also note: the afternoon summer sun warms (and I mean WARMS) the wall where the public access line is located. To avoid any long delays book in advance! Michelangelo. It is a name that conjures images of paint strained eyes, of angry popes and of marble dust. The Bacchus, an unusual and controversial work, was created by Michelangelo between 1496 and 1497, when the young artist was twenty years old. The commission came from a rather unexpected source, that of Raffaele Sansoni Galeoti Riario, who became Cardinal Riario. Passionate about sculpture and, in particular his garden, Riario had commissioned the piece to add to his home sculpture garden in the Palazzo della Cancelleria in Rome. An interesting side story to this commission. Riario was sold a sleeping cupid as a true piece of ancient Roman art. The connoisseurship of the Cardinal was widely known and he, eventually, discovered that the piece had been carved by Michelangelo. Upset though Riario may have been, he was also an astute businessman. It was his orders that brought Michelangelo to Rome where the artist worked for most of the remaining years of his life. 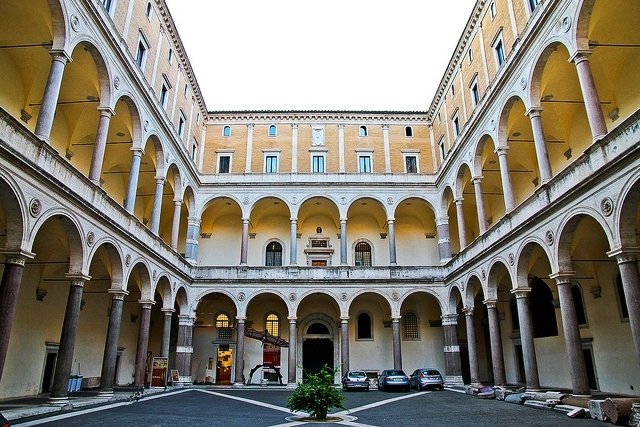 As the photo of the Cancelleria, the Chancellery of the Vatican, attests, Riario had enormous financial resources available to support his commissions. Riario hated the work and refused to accept it. However, an associate of his at the Vatican, one Jacopo Galli, Riario’s banker, patron and friend of Michelangelo, paid for the commission and placed it in his private collection. It was not until 1847 that the statue was transferred to Florence where it now resides in the Museo Nazionale del Bargello in Florence. It is a strange work, to say the least. 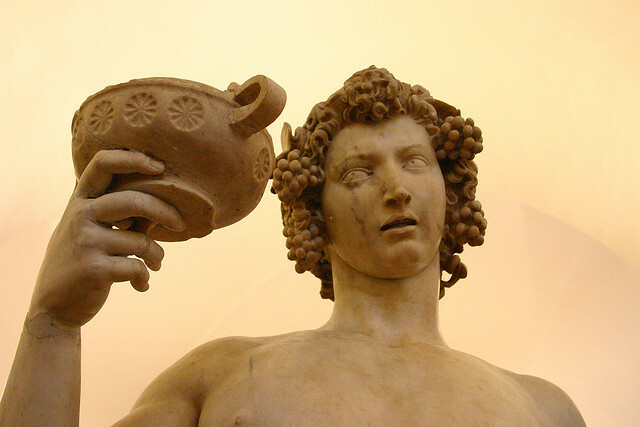 The expression of Bacchus, the asexual nature of his body, the posture of drunkenness he displays were all brilliant and intentional marks of a master artist. What offended Riario and what often offends people to this day is that the statue does not fit most people’s expectations of a god. 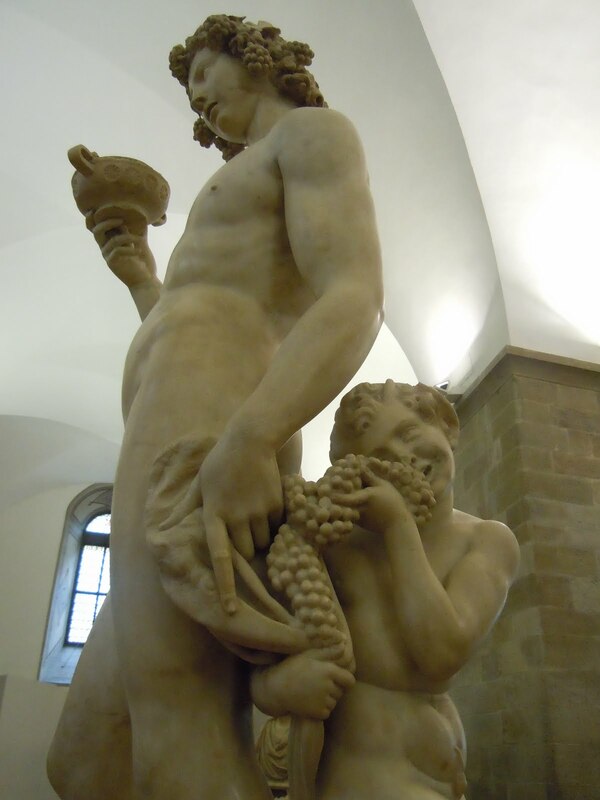 Human in every aspect, with a grape-eating faun at this side, was – I believe – a not too indirect way for Michelangelo to portray his view of Riario as a person and, perhaps, the church in general. Known to be exacerbating, difficult, unpredictably emotional, the young sculptor may have seen this commission as a way of communicating his disdain for the patrons of his youth. It may have galled Michelangelo to know that a sleeping cupid had been the means by which orders came from Pope Julius II, one of Riario’s relatives, for the artist to report to Rome. When you are in Florence, be sure to take a morning (see open hours below IF YOU GO) to explore the galleries in the Bargello Museum. The Ground floor gallery houses many pieces of remarkable sculpture, the Bacchus among them. The second floor galleries house Donatello’s David, works by the Della Robbia workshop and many other treasures of Renaissance art. 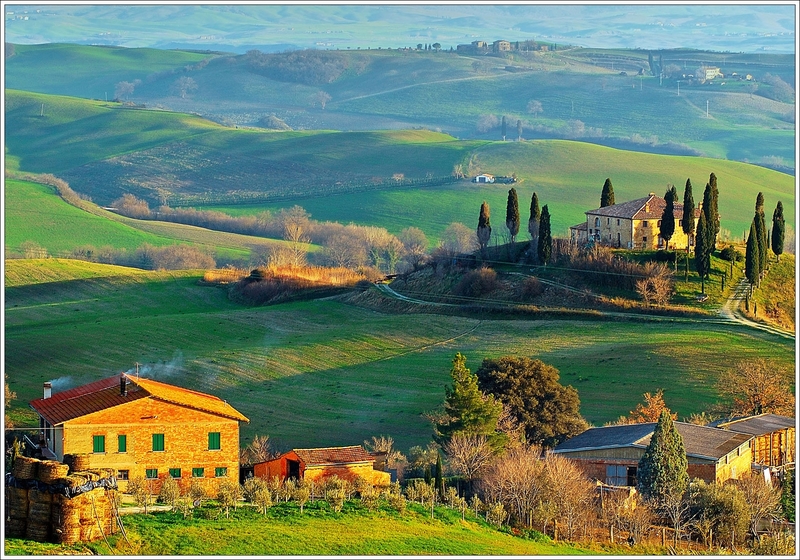 Photography Workshop in Florence & Tuscany – April 27 to May 4, 2013-NEW PRICING! We are very pleased to announce a substantial reduction in the price for photography workshop participants. After renegotiating with vendors in Italy, and with Private Italy’s Italian support team, we are now offering this exceptional workshop for $2950.00 per person, land only. This is a nearly $1000.00 per participant reduction from our prior announced price and in no way affects the quality or itinerary of the workshop. If you book before January 31, 2013, there is an additional $100.00 per person discount applied to the workshop price. Visions of villas gold flecked in long afternoon light, hillsides of patterned olive trees, vines bearing luscious Sangiovese grape and hilltop villages whose towers pierce cerulean blue skies are all yours to capture during this photography workshop. 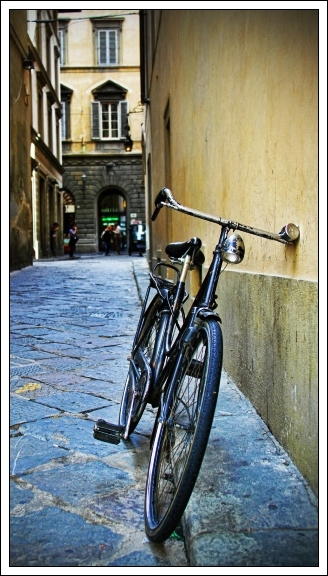 Our first few days are spent within, or close to, the Renaissance city of Florence. The workshop venues balance the well-known with some surprising corners of a city whose narrow lanes and quiet corners offer keen insights into Italy’s elusive beauty. During the second part of this workshop, we move to a quiet retreat in the hills of central Tuscany. Villas, medieval abbeys, the pattern of cobble-stoned streets and the glory of Italy’s elusive, special luminance await your discerning and creative vision. This is a limited opportunity to join a group of like-minded, passionate, photographers who will learn from world-renowned photographer and teacher, David Simchock. With time for expert critique both during and after days of work ‘in the field’, this workshop will inspire you and expand your creative comfort zone. The texture of earth, the subtle play of light on stucco and stone, luxuriant gardens and the natural palette of one of the most beautiful places on earth are waiting for you. We look forward to your joining us in bella Italia! Introductory Note: Among the lanes and avenues of ancient Rome were apartment buildings known as insule (insulae, plural). Within these structures were small upstairs rooms that were used for meals. The Italian word for the dinner meal, cena, comes from the Latin word for those upper rooms: cenaculum. The Italian word for the Last Supper, Cenacolo, is also derived from that same base word and is used interchangeably with “‘l’Ultima Cena” (The Last Supper of Jesus and his disciples). My first encounter with Taddeo Gaddi’s fresco of the Last Supper and Tree of Life came late on a summer’s afternoon. Santa Croce lies east of the Piazza della Signoria. The ancient lanes you walk to arrive at the Piazza Santa Croce take you past the area where the ancient Roman amphitheater of Florentia once stood. My goal was to visit one of the most famous symbols of Florence, Cimabue’s Crucifixion. It was only upon entering the vast space of the refectory that the scale and beauty of Gaddi’s work came to me. Below the Tree of Life is the Last Supper, a work that was heavily damaged during the floods of November 1966. It has been painstakingly and lovingly restored. On another day in Florence, I was fortunate to be introduced to the work of another Renaissance artist, Andrea del Castango. His luminous Last Supper, a fresco on the northwest wall of the refectory in the Convent of Sant’Apollonia, came as yet another surprise. Last Suppers. Florence. Cenaculum. Upper Rooms. My curiosity was roused. How many paintings of the cenaculum exist in the city? My search for the Last Suppers of Florence began. No fewer than seven Last Supper frescoes exist within the confines of the ancient city center. From Santa Maria Novella on the northwest part of the, to Ognissanti in the city center, to Santa Croce and San Salvi in the east, the collection of these incredible works span centuries, united by their subject matter. By taking the time to visit them, visitors can learn a great deal about the changes made in the art of fresco during the Renaissance. An added bonus is that these marvelous pieces of art are rarely visited by but a few tourists. Rather than detail each of these unforgettable frescoes, I have placed photos of the frescoes below, in time line sequence, earliest to latest. Below each photo are details about their location, the open hours, the price of entrance tickets, and some brief analysis and information about the work. Regardless of your religious beliefs, the beauty of these frescoes and the places they were created, offer visitors ample opportunity to more deeply understand the profound influence of the Christian church on the artists and history of Renaissance Florence. I hope that those of you who visit Florence will take time to visit these unforgettable works of art. Other than the Last Supper by Leonardo da Vinci and very few other frescoes, Gaddi’s work placed the disciple Judas Iscariot on the opposite side of the table from Jesus and the other disciples. This same configuration is repeated in most Renaissance Last Supper Frescoes. Location of Ticket Office: The ticket office is on the north side of the basilica. As you face the facade of the church, go to the left side and you will find the ticket office and visitors entrance. The refectory is through the church nave on the south side of the complex. Castagno chose to place the figure of Judas facing to the right, unlike Gaddi’s composition which had Judas looking to the left. Also, Castagno has Judas and Jesus in closer proximity than in Gaddi’s earlier work. Be sure to check hours of the Mass so you do not interrupt services. In the first of two Last Supper frescoes commissioned with Ghirlandaio, (see next listing below as well) Judas is facing left and rather than St. John being bowed onto Jesus’s arm, in Domenico’s work he portrays the disciple as deferential, his head nearly even with that of Jesus. Considered by many art historians and experts to be the finest Last Supper of the 15th and 16th Century Italian Renaissance, Ghirlandaio’s second Last Supper – his first (above) was completed two years earlier – reflects important lessons learned in both the quality of the paints used in the fresco, the depiction of body posture and the refined use of perspective. Early attributions of this fresco were to the Renaissance artist, Raphael. Further inspection and study revealed it to be a work by the Umbrian artist Pietro Perugino. Some art experts believe that this fresco was painted over a late 15th century work by Neri di Bicci, a Florentine Renaissance artist. The fresco is considered to be the finest example of Umbrian Renaissance art in the city. In 1530, the commander of Spain’s Charles V’s troops who had invaded Florence spared this work owing to its incredible beauty. Andrea del Sarto chose to place Judas to the far right, so that the other figures in the painting would be the focus of his work. The fine detail of this fresco is incredible to see and well worth the effort of finding your way to the church of San Salvi. One of the most unusual frescoes and paintings of the Renaissance. Allori’s work, mannerist in style, is actually two works of art: fresco and canvas. The panel in the lower center of the fresco is actually a canvas on which Allori has created a vision of an energetic and physically active Last Supper. There is a heretofore unseen vitality and dynamic to this depiction of the event. Allori’s unique work served to inspire other artists of the late 16th Century to experiment with new styles of art. This is the final depiction of the Last Supper in a Florentine church. My first encounter with Botticelli’s breathtaking Annunciation at the Uffizi Gallery was many years ago. Crowds strangled any reasonable view of either the Primavera or the Birth of Venus, so I turned my attention to works along the ‘side walls’ of Gallery 10. What a marvel. Translucent wings curve along the back of an angel. A long and transparent flowing robe trails beneath the wings, adding an even deeper sense of the apparition’s unworldly arrival. Mary’s demure gaze, the curve of her body away from the angel and the position of her hands seem to communicate, all at the same moment, a sense of disbelief, hesitation and acceptance: all marks of the one of the most incredible artists of the Renaissance. The work was completed, most experts agree, in 1490. It was in that same year that a Dominican monk from Ferrara, one Girolamo Savonarola, arrived in Florence. A rabid and vocal opponent to Medici power and a strident interpreter of scripture, he roused the population against the government. His fiery sermons inspired the majority of the city’s citizens to turn away from any form of vanity or self indulgence. Botticelli fell under the monk’s spell. While the Annunciation portrays a devout and holy scene, the work that Botticelli produced after the monk’s death in 1498 reflect a far more intensely religious character. In the background of the Annunciation are scenes of the artist’s time: a walled hilltop village, an arched bridge across a river with yet another walled city, towers to the right. The space through the window adds remarkable dimension (See my Massaccio’s Trinity post) to Botticelli’s vision. As I study this painting now, another thought occurs to me. Nearly six-hundred miles to the south of Florence, in the southeast mountains of Sicily, is a valley that is lined with caves. Some of these caves date to pre-historic times. On a recent visit, I walked this valley (Valle di Ispica) and discovered that, in many of the caves, there are remains of early Christian frescoes. Along the ceilings and some of the walls is evidence that these caves were used as places of worship, safe protection against Roman rule during the centuries prior to Christianity’s formal recognition. As I consider Mary in the Botticelli piece, my thoughts turn to a cave where, perhaps, “her” angel arrived. A threadbare and hungry Mary, startled by the implications of the angel’s message, might well have retreated to a fire warmed cave where she gave even deeper consideration to the message received. Botticelli’s romanticized vision certainly fit the expectations of his era, yet I ponder what Mary’s circumstances might have truly been. So it is that caves on Sicily inspire a more austere interpretation of where and how a certain angel might have spoken to the chosen woman. All of Botticelli’s works still astound me, yet the Annunciation remains above them all. I recall transparent wings, Mary’s encounter all those centuries ago and fresco fragments in ancient caves. Uffizi admission is far better is you reserve a specific entry time for the museum, and get your tickets paid and issued in advance. Public admission lines are often two to three hours long. You must be at the entrance door for pre-reserved tickets within fifteen (15) minutes of your reserved time. If you miss that time window, you may find it very difficult to gain admission. Also, be aware that once you go through security at the museum, there are three very long and steep flights of stairs you must climb before you arrive on the main gallery level of the museum. There are elevators inside the secure area of the museum. If needed, you can request their use. Below is an excellent map. You arrive on the gallery level using the stairs indicated near Gallery’s 3 & 4. The oddly shaped chamber between the stairwell and the gallery hall is occupied by guards. Botticelli’s works are in Galleries 10 – 14.